Edward Savage (1761–1817 ,US), Ebenezer Seaver, 1795–1800. Watercolor on ivory in gilt copper locket, 5.1 x 4 cm (2 x 1 1/2”). © Worcester Art Museum, Worcester, MA. (WAM-184) Ebeneze Seaver (1763-1844), born in Roxbury, Mass., was a US representative from Massachusetts (1803-1813). He was also a state representative 1822, 1823, and 1826. I love miniatures from early American art! I dearly want a miniature of myself hanging from my loved one’s keychain as a Christmas present! However, miniature artists are few and far between these days. I’ve already written about miniatures in this blog, so let’s concentrate on Edward Savage. He is a fascinating example of an artist who made a living in the early years of the republic, relying on good old American determination. Savage was born in Princeton, MA and initially worked as a goldsmith and engraver. In 1790 he traveled to London, briefly studying under ex-patriate American artist Benjamin West (1738–1820). He also traveled to Italy to check out great masterpieces of art from the Renaissance and Baroque. When one compares his family portrait (pre-Europe trip) to his portrait of the Washington family, one can see his progress. However, like most self-trained artists of the early American period, he reveals a lack of solid understanding of anatomy. That notwithstanding, his ability to imitate the effects of materials in his paintings is remarkable. 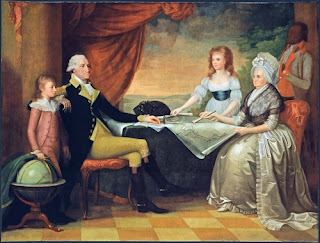 His portrait of the Washington family, initially in mezzotint form, was immensely popular, posted in buildings all over the new United States. Edward Savage, The Savage Family, ca. 1779. Oil on canvas, 66 x 88 cm (26 x 34 5/8”). The Savage Family is, by far, my favorite work by Savage. I love the way he lined the family up in order of height! 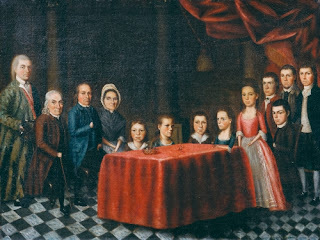 It’s an early work (he was 18), and the comparison with this family portrait and the miniature are indicative of his progress as a self-trained artist. The Washington Family is a much more accomplished work of perhaps fifteen years later, after the Revolution. The family posed for Savage in New York in the winter of 1789–1790. At the time New York was the US capital. He initially produced prints of the portraits, and eventually finished a large version in oil in 1796 after he returned from Europe. 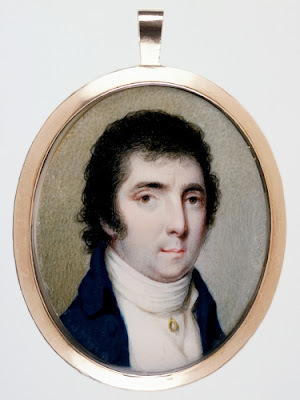 The best part of the Huntington's art collection (San Marino, CA) is the miniature portraits on display. Small and intimate, they are in frames of gold and jewels (no doubt to enhance the sitter), wonderful keepsakes or introductions.